An exceptional intact chamber tomb from the 4th century B.C. was discovered during construction of a water pipeline in a suburb of Rome. It was found when an earthmover opened a hole in the side of the chamber, thankfully doing no damage to its overall structure or contents. By law, an archaeologist must be present at construction projects in Rome and environs, but the area had been worked for a year with little archaeological material to show for it so on-site archaeologist Fabio Turchetta didn’t expect they’d stumble on anything of any import. He certainly didn’t expect to find a complete, untouched tomb from the early Roman Republic. The chamber tomb was dug into soft volcanic tufa and sealed with a large slab of limestone. It contained the skeletal remains of four individuals, three men and one woman between the ages of 40 and 50. They were inhumed at different times. Two of the men were placed up high on stone ledges. The woman was on the floor of the tomb in a crouched position and the third man next to her. 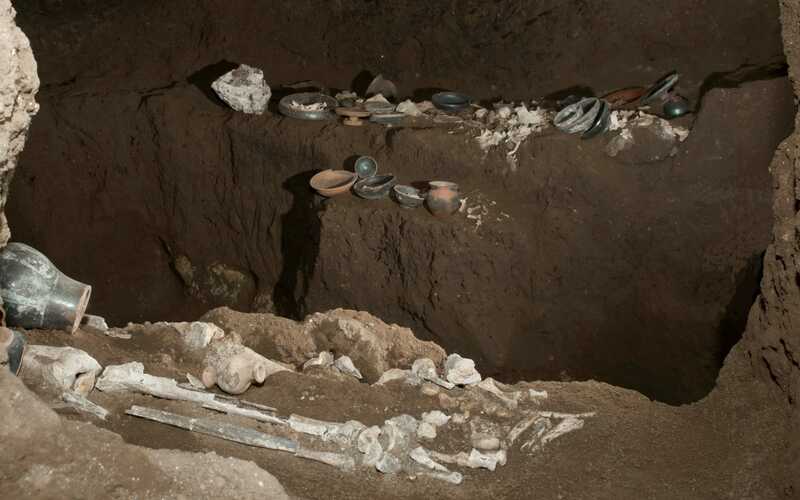 Archaeologists believe it was a family tomb, that the people buried there were related to each other instead of the tomb having been invaded and reused in a later period, a common practice that often resulted in the destruction or damage of earlier burials. The deceased, the two men on the ledges in particular, were laid to rest with a spectacular array of funerary goods. Two iron strigils, scrapers used by athletes to clean themselves after a workout, inspired the team to name the chamber “The Tomb of the Athlete” even though the interred would have been well past athlete age in their era, and anyway strigils were used for cleaning by non-athletes as well. 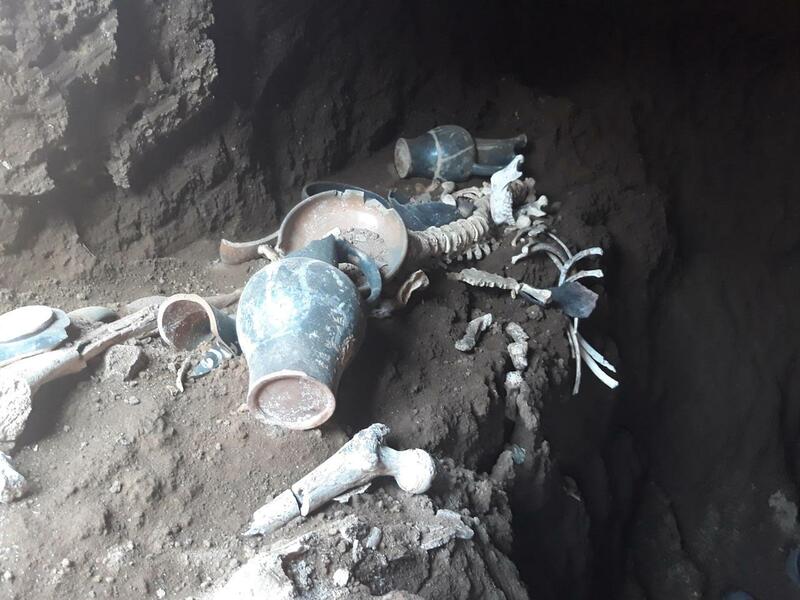 A total of 25 artifacts were recovered from the tomb, mostly black-glazed pottery bowls and plates with their white decorations still vivid. 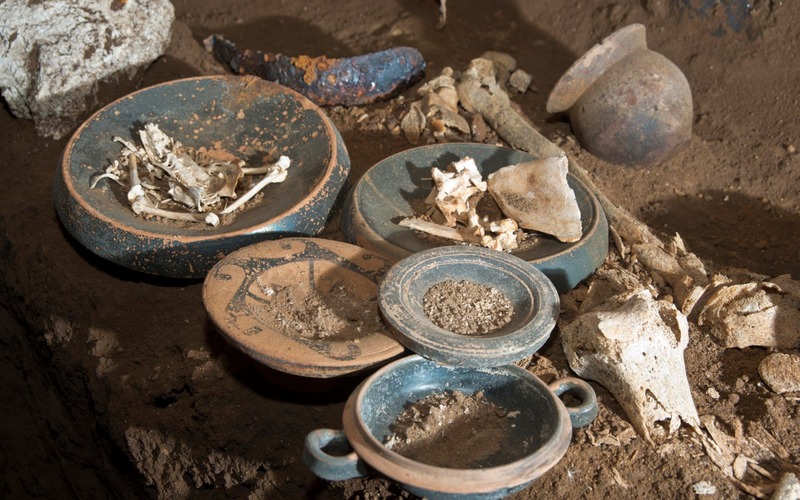 The tomb was in such inviolate condition that the vessels still contained the remains of funerary offerings: bones of chickens, rabbit and a lamb or kid. The tomb and the number and quality of the grave goods and offerings indicate the deceased were wealthy people, part of the societal elite. 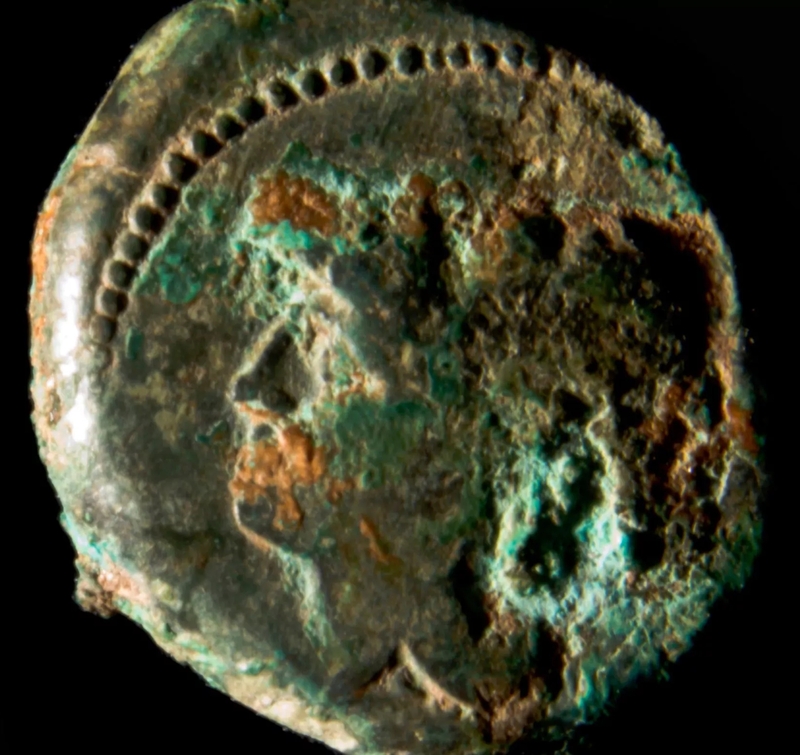 A coin found next to one of the skeletons dates the tomb to between 335 and 312 B.C. The bronze coin depicts the head of Minerva on the obverse and a horse head inscribed “Romano” on the reverse. The style of the pottery confirms the dating of the tomb to the second half of the 4th century B.C. The Case Rosse neighborhood where the tomb was found is on the Via Tuburtina, a Republican-era road that goes from Rome east to Tivoli (ancient name, Tibur) and then Pescara on the Adriatic. It exits the ancient traditional boundary of the city through the Porta Esquilina in the Servian Wall, and the historic center of Rome through the Porta Tiburtina in the Aurelian Wall (built in the late 3rd century A.D.). Case Rosse is 10 miles outside of the ancient city of Rome. The Via Tiburtina was decades away from being built when the men in the chamber tomb died, and the Servian Wall, built in reaction to the first Sack of Rome in 390 B.C. by Gallic forces under Brennus, was just a few decades old. It was a momentous century for the city in many ways. Rome bounced back quickly from the sack and in the second half of the 4th century defeated their Italian neighbors — the Etruscans, the Samnites, the Volsci, the Sabini, assorted other Latin tribes — and absorbing their lands and peoples into the foundation of what would become a vast empire. The individuals buried in the tomb, therefore, were likely Latins, as the Roman identity was still attached to the city itself and only taking its first steps outside of the pomerium with the dissolution of the Latin League confederation after it was decisively defeated by Rome in 338 B.C. 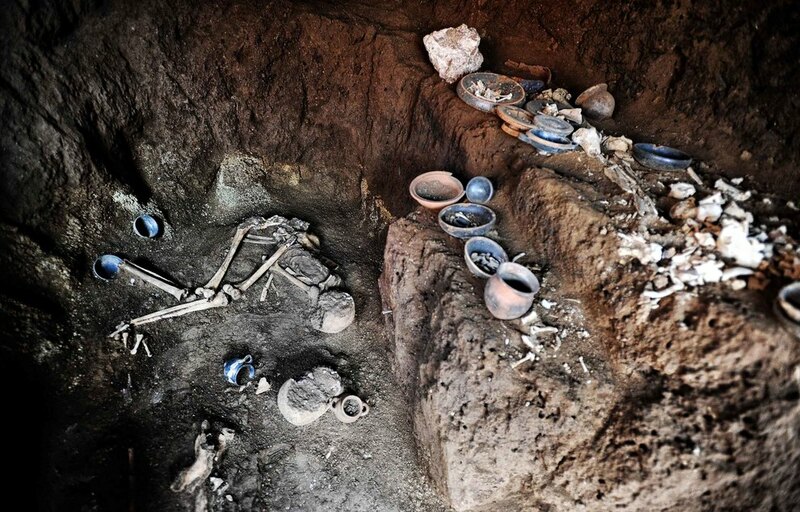 One of the reasons this tomb is so important a find is that its untouched condition and organic materials provides them with a unique opportunity to study the funerary rituals of the Ager, the countryside that had been absorbed by Rome politically but was still not Rome. On Friday, archaeologists began to remove the occupants and the artifacts, which will be sent to a laboratory for research, including DNA testing on the skeletons to determine the familial connection. One expert, Alessandra Celant, a paleo-botanist at the University of Rome La Sapienza, carefully collected ancient pollen and plant samples from the tomb — “the tip of a pin is enough,” she said — that she will study to potentially reconstruct the flora and landscape of the area, as well as funerary rituals. The tomb was mapped with a laser scanner, and once it has been emptied, it will be sealed.